If ever a life of working for and on behalf of brass bands was worth celebrating it’s that of Edward Gregson. 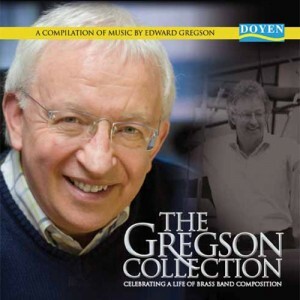 I cannot think of a single composer who has done more to expand and enrich the repertoire of music for band than this man…it was Gregson who really dragged the band movement into contemporary composition, through a lifetime of devotion to the genre…This 2 CD set has been released to celebrate Gregson’s 65th birthday and takes recordings from many of the excellent issues of his work on the Doyen label, presenting them in chronological order. This is very sensible indeed, for one can hear his development as a composer and as an innovator….If you’ve written off the brass band medium, thinking it to be a restricted genre, Gregson is the man to bring you into the fold with his colourful, sometimes challenging and always entertaining music.